Alternative browsers were made with a purpose. Polarity was designed to be much more energy efficient and light weight than other browsers, so you can browse longer without the fan kicking in. Built in privacy features such as DoNotTrack and Privoxy allow users to browse with confidence. With a wide selection of apps, themes, and extensions, you'll feel right at home with Polarity. Polarity is designed with efficiency in mind to be able to run on lower end hardware such as tablets and older PCs. Even with its multi-process architecture, Polarity is optimized to reduce bloat and memory leaks that could consume unnecessary amounts of RAM. RAM usage measured in MB. Close less and do more. Polarity's active garbage collector optimizes RAM and resource consumption in Polarity to take as little RAM as possible. 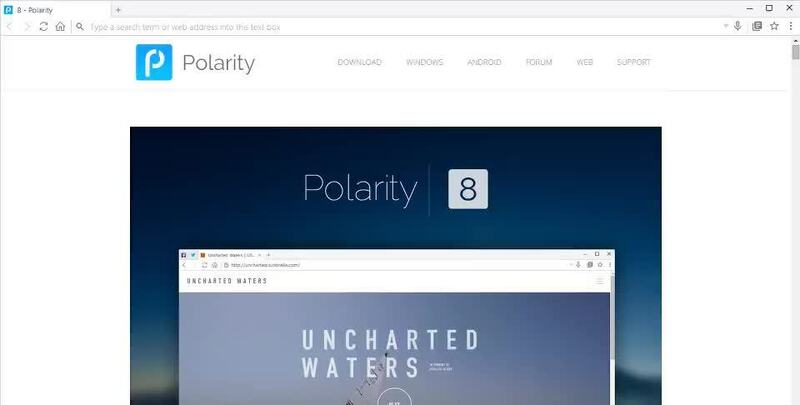 Polarity is the most efficient web browser ever developed. So instead of closing programs to free up space, Polarity allows you to open more to do more. Extend your laptop's battery life up to 45% by simply enabling Power Saver mode. This will block intrusive animations such as ads (Flash/GIF), disable WebGL, browser and website animations, and enable Google's QUIC protocol to help compress and speed up browsing speeds. Powered by both Chromium and Trident, Polarity supports the latest web standards along with backwards compatibility. With hardware acceleration and WebGL support in both engines, Polarity delivers an immersive experience that puts the web first. With Web of Trust built right into the browser, the web became a safer place. Polarity will display the scores of each website in the security info window as well as the certificate information. Polarity will automatically warn you about any malicious websites, but will automatically block those that the WOT community found to be 100% infected. Privacy is essential in preventing your credentials from being used by third party services. Polarity comes with a couple of tools to combat targeted surveillance from many web services. 80% of the web relies on tracking services to power a growing industry from selling YOUR data. Polarity will never sell your data. Sandboxing in Polarity was designed to prevent malware or drive by downloads from installing or running malicious code that could harm your system. With sandboxing, Polarity's multiprocess architecture allows tabs to be isolated from each other. Therefore when one tab becomes unresponsive, the rest of the browser is not affected. Polarity's built in cookie manager allows you to manage and delete what cookies are stored on your system. From there you can find out what information and from which site each cookie is from. You can simply wipe out all cookies with a click of a button. You can easily protect your online identity with Polarity. Polarity comes built in with Proxy/VPN support to help protect your online identity from being compromised. You can easily set up a browser specific IP and Port for Polarity to use. Polarity will automatically detect global VPNs installed on your system and will filter traffic with them. In Private Mode, Polarity does not remember any of your history, cookie, or cache during your browsing session. All browsing data is automatically deleted upon exit. With Parallel Sessions, each tab gets its own cache to create a safer browsing environment. In private mode, Polarity will automatically block all content that will allow websites to track your browsing behavior. With the power of EasyList ​/ EasyPrivacy combined with the efficiency of Privoxy, Polarity comes built in with the latest filters to remove intrusive, power wasting, and potentially malicious adverts from your content. This reduces the chance for infection and saves data. Customize to your heart's content. The Polarity Store offers a wide range of apps and themes that you can customize Polarity with. Polarity also supports extensions from Greasy Fork, OpenUserJS, Userscripts.org, and Userstyles to offer additional functionality to each website. You can easily create themes that you can use and submit to the store within the settings window. Polarity's built in sharing tools allow you to share with any social network instantly. Pin the sites that matter most. Pinned tabs are neatly tucked away to the side of the browser for easy access for the sites you use most -- like Facebook or Twitter. Pinned tabs are always saved on exit and load automatically on startup. Pinned tabs also alert you for incoming notifications or updates to the site. The tab will blink amber to notify you of any updates. Polarity is voice activated and can listen to your commands or search queries and instantly take you to the website that has the most relevant content without searching. Just click the microphone icon to start. The minor things that make browsing a whole lot better. These are just some of the minor additions to Polarity to enhance browsing experience. Polarity is partnering up with Ecosia to help plant trees in Africa in support of the Great Green Wall Project backed by the African Union and the World Bank. Built just for power users. Control Center allows you to easily manage and find all your open tabs as well as execute commands in a simple and intuitive user interface. Easily manage all your login information in one place with PolarPass. All information is encrypted and tied to your specific client of PolarPass. PolarPass will automatically fill out information to take the hassle out of logging in. Take screenshots right in the browser. ﻿Quickly take a screenshot in the browser with PolarShot by pressing Ctrl + F2 or from the context menu. Then, simply drag and drop to select the area you want. Your data on the go. PolarSync compiles all your custom preferences and session data into a neat package that you can take on the go. Simply open PolarSync from another device to import your existing configuration from your USB drive or the cloud. Click to play allows users to determine when a plugin should be run instead of having the plugin start automatically after loading. This could mitigate the annoyances of random advertisements. This option can be enabled via the settings tab. Tab pausing enables Polarity to release resources and terminate any rendering processes in an inactive tab in order to conserve memory and power consumption. This feature can be enabled via the settings tab. Polarity comes built in with night mode in order to make browsing the web more comfortable. Blue light from monitors can inhibit the body's natural sleep cycle and night mode could help to reduce the effects by dimming every website. Scrolling is fast and fluid in Polarity 8 to make browsing even better. Downloads are fast with Polarity. The download manager displays real time data on transfers speeds and download duration. You can easily pause and resume downloads if needed. You can easily watch your favorite Youtube videos while surfing the web on the same tab. Simply pop out the Youtube video from the context menu to watch your video without having to switch tabs. Polarity comes integrated with Readability and Feedly. For regular articles, enter reader mode to get a seamless reading experience with adjustable fonts and backgrounds. For RSS feeds, Feedly intelligently aggregates feeds from websites for a better reading experience. Document Explorer. Revamped and ready. The new Document Explorer is better and faster than ever. Document Explorer allows you to debug both in Chromium and Trident. Element parsing and debugging has drastically decreased in time along with the addition of new features. New useragents allow you to view the web from other browsers without having the launch them. Smart snapping automatically tiles your windows to provide an easy way of viewing code. Polarity will provide support for other languages from around the world. With this, Polarity will be more user friendly for everyone. Polarity is a fast browser built for efficiency and privacy. With Polarity's rich functionality, flexibility, and incredible speed, Polarity brings the best browsing experience in a small package.